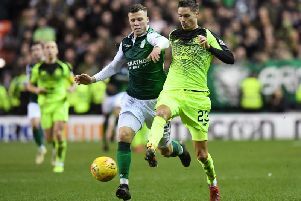 Alan Stubbs today admitted he can’t wait for the day when he can unleash his first-choice strikeforce after watching his Easter Road side score eight goals without their top hitmen. The Hibs head coach had already been without Farid El Alagui for five months when top scorer Dominique Malonga left on international duty with Congo at the Africa Cup of Nations, leaving many wondering where the goals would come from. But teenager Jason Cummings made it six in five matches as he found the net again during the 5-0 rout of Cowdenbeath to become the leading scorer in the Championship on a day when new striker Franck Dja Djedje was also missing with a hamstring problem. Today Stubbs revealed Dja Djedje was likely to be out for “days rather than weeks” and with El Alagui, who had claimed four goals in six matches before rupturing his Achilles tendon at the end of August, inching ever closer to full fitness and Malonga due to return from Equatorial Guinea early next month, the Hibs boss is counting down the days until they are all available together for the first time. He said: “The one thing we will definitely have when everyone is fit is goals. It’s going to be a nice selection dilemma for me. We are going to have a very potent strikeforce. As a manager that’s what you need, real quality at the top end of the pitch. “Farid was great early in the season, Dominique had been really good since he came in and Jason has come through a period where he was trying too hard but then suddenly he put himself in the right place and since then he has not looked back. He’s in a really good vein of form at the moment. Five different players scored against Cowdenbeath as Hibs closed the gap on second-placed Rangers to five points, including rare strikes from full-backs Callum Booth and Lewis Stevenson, which followed earlier goals from fellow defender Paul Hanlon, Cummings and midfielder Scott Robertson. Hibs enjoyed a further bonus from the weekend with Jordon Forster playing the final 12 minutes after three months out, with a broken foot followed by emergency surgery to remove his appendix, and the central defender is pencilled in to continue his comeback in tomorrow’s “mini” derby against Hearts at Spartans’ Ainslie Park complex, kick-off 7.15pm.